When people work together it can be tricky – different personalities, different experiences, different thought processes, different beliefs, different opinions, different cultures and….. different paces of learning. 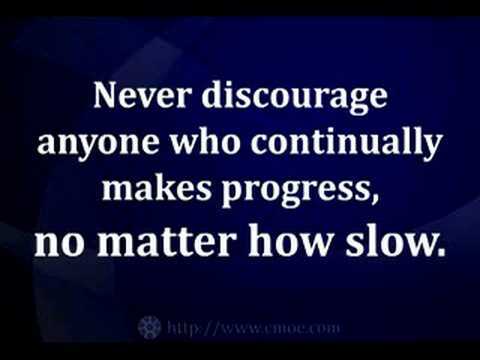 I believe that making progress is one of the most overlooked things in the corporate world. Think about little children who learn how to walk. Some will walk with 9 months, others will walk with 15 months but it is a given that they will walk. If your child wouldn’t walk at 12 months, would you say, “You are too slow. If you fall down one more time, just stop trying” ? For every good parent this would be unthinkable, right? Yet, in the corporate world people get put down on a fairly regular basis. People are criticized and their voices often stay unheard. Think about it, if people can’t do anything right, it affects their self-worth and their self-confidence. As a result, they will stop believing in their ability to contribute value, which in return will affect the bottom line. Example: Employee’s name, I really appreciate your positive attitude and that I can always rely on you to get the job done. Can I provide one suggestion that will help you to get even better? I would like that you involve your team members more by asking them open-ended questions (i.e. How can we improve things around here? ), because (WWIFM – what’s in it for me) it will help you to create more engagement on your team. Follow up after 1 week (critical) – I have noticed that you have started……. How do you feel about your progress when it comes to involving your team members? Listen to what he/she has to say. Be patient and persistent – a new skill needs to be developed and this person is probably outside of his/her comfort zone. If the person has mastered it, move on to the next point of improvement. Everyone has room for improvement, even your star players. Remember that progress is better than perfection.